Summary: The description, specs, pricing, photo and user ratings of the Arex Rex Zero 1 Combat pistol. The Rex Zero 1 Combat from the left. 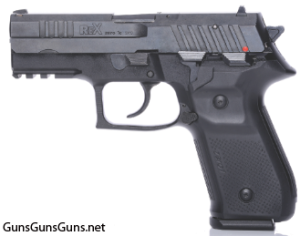 Arex, which is based in Slovenia, also offers full-size and compact versions of this pistol. The FIME Group imports the full-size version into the United States. 9mm, 9x21mm 17+1, 18+1, 10+1 3.85″ 7.1″ 5.5″ 1.35″ 1.72 lbs. .40 SW, .32 ACP n/a 3.85″ 7.1″ 5.5″ 1.35″ 1.72 lbs. This entry was posted in .32 ACP, .40 SW, $501-$750, 9mm, 9x21mm, Arex, Full size, Semiauto on March 30, 2016 by Staff.